This PDF 1.5 document has been generated by Microsoft® Word 2013, and has been sent on pdf-archive.com on 29/03/2018 at 14:06, from IP address 114.143.x.x. The current document download page has been viewed 107 times. File size: 637 KB (5 pages). launch on average attract much more capital compared to average venture capital funding rounds. nearly $4.5 billion during the same period. launching projects as a sales or funding model. manage and grow the proposed project. 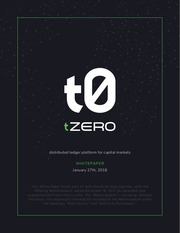 end date for ICO token sale. cryptocurrency exchanges. The second method is similar to the traditional IPO process. achieved in cryptocurrency or digital currency, we could generate tokens and lunch an ICO. small fee for every transaction ensures token runs well on the Ethereum Blockchain. is mandatory for every startup to have a strong legal support backing ICOs the time of its launch. Cryptocurrency has been an amazing source of innovation on both fronts – technical and business. get clarity to adjust their ICO models to accommodate realistic funding sequence. makes it an attractive investment option for investors and a medium of crowdfunding for startups. you to launch and market it. Contact us if you need any assistance to launch your ICO. This file has been shared by a user of PDF Archive. Document ID: 00751003.